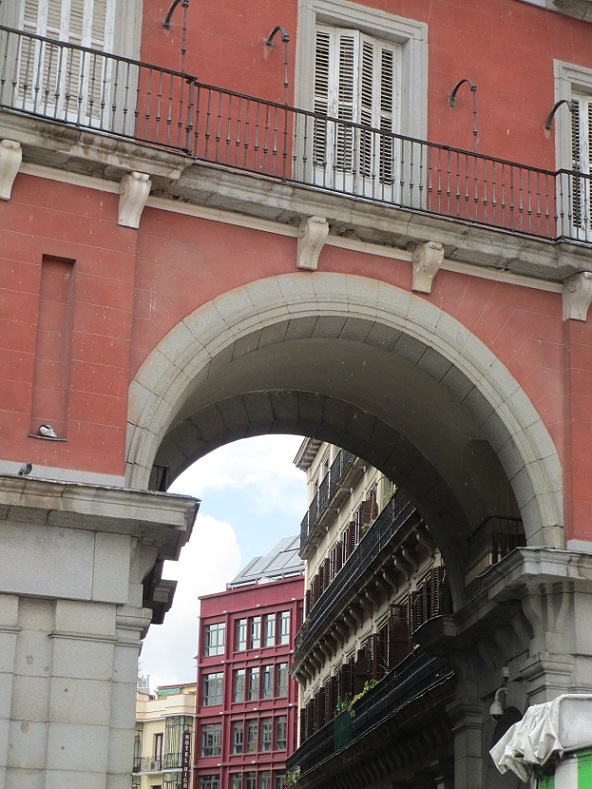 These pictures of arches are from around the Plaza Mayor in Madrid. The actual reason that I took some of them was to remind me of which way I entered the plaza so that I wouldn’t get lost! Many times when I travel I become so interested in seeing everything that I forget to notice which way I walked to get there. To keep from getting lost I’ll take pictures of street corners, pedestrian signs and unique buildings or landmarks so I can retrace my steps later. It works quite well and I end up with some interesting pictures of subjects other than the expected ones. I also took some of these pictures simply because I liked them and they are not just reminders of where I had walked. This is one of my souvenir pictures from Madrid. You can find more arches here. This entry was posted in Madrid, Spain, Travel and tagged arches, Plaza Mayor, walking. Bookmark the permalink. I loved the architecture of Madrid too :)) and was constantly looking up…beautiful pictures! Thanks – I was really impressed by the architecture too! Want to chime in with the orples, Meg? Check out the Category ‘Visiting the Neighbors’ on my blog to get an idea of what the orples and I are up to lately. They would love to play in your mud puddle, for sure. Let me know if you’re interested in allowing them to tag along with you on occasion. The two posts ‘Literate for a Day’, and ‘Return Address’ sort of explain what’s happening. The other entries are examples. As a child I always wondered why the bricks or rocks in the middle of the arch didn’t fall down. I used to wonder about that too – there’s something about them that is so ingenious! My favorite is the last picture – seeing the buildings angle off through the arch. Thanks – I thought that that view through the arch looked like the beginning of another interesting adventure! Thanks – I was amazed by these arches and all the interesting scenes beyond! fabulous photos of one of my favorite places!!! Thank you – it’s one of my favorites too! Every arch seems to open up new opportunities for discovery. Great photos! Thanks and that’s just what I thought – lots of opportunities for adventures! Plaza Mayor is a beautiful square and I couldn’t agree more with food. For a landlocked city the restaurants has excellent selection of seafood. Gambas al ajillo and grilled sardines, yummy! My mouth is watering. Nice arches. Thank you Suzanne – I really rely on having some pictures for guidance and then I keep them as souvenir postcards when I get home! Thank You for this presentation of architecture in Madrid. Very beautiful photos. I have forgotten how beautiful it can be since then I visited there in 1970. Thanks – it’s such a beautiful place and the architecture is amazing! That’s what I call an adventure! And here I thought I was alone in photographing street corners and buildings as I wander about in new cities and surroundings. Once I photographed a ferris wheel near a pier thinking I would surely spot it on my return. They dismantled it while I was wandering about town. Momentary panic until I could identify other landmarks in the photo. Oh, I love Spain and would love to go back. The Plaza Mayor is amazing. I went on a school trip and we had a tour guide so getting lost wasn’t an option…or was it. A small group of us girls somehow missed the double decker bus and got separated. We made it to the plaza but spent most of the night trying to find our group. How very clever you are taking photos so you can find your way around. What a great idea! Thanks Karen – it really has kept me from getting lost!